An orbit around Ft. Pike at the Rigolets in New Orleans East. The fort is closed to visitors as of this posting due to budget constraints. Just checking up on it via Yuneec Typhoon H drone and 4K video. A quick zip across City Park Lake from the beach in Baton Rouge. Then a traffic watch at the I-10 bridge. 4K video from a Yuneec Typhoon H.
Here's a 4K video look at Baton Rouge's chunk of the Mississippi River at high water stage on March 24, 2019. From a Yuneec Typhoon H hexacopter with 4K CG03 camera. Most of the birds were on the shore today, so after a quick jaunt over Baton Rouge's City Park Lake, we came back to the shore near the beach to have a look at the ducks and egrets from above. 4K video from a Yuneec Typhoon H.
A 4-minute trip over JD's Baton Rouge neighborhood in the fall, just to run the battery down to storage level. While definitely not the Berkshire Mountains fall foliage of Massachusetts, there does seem to be a bit of local color. 4K video from a Yuneec Typhoon H. Editing and music by Pinnacle Studio 21. JD flies his Yuneec Typhoon H hexacopter over Lake Pontchartrain and the marshes in Lacombe, Louisiana, at the end of Lake Road, inspecting a partially sunken boat alonng the way. Then JD boards his own Camaro as a passenger so he can have his drone follow (or, more properly, lead) the car up Lake Road. His buddy Jim Tauzin does the driving. It would have been fun to go further, but operating a drone from a moving vehicle can only be done in a sparsely populated area, and further up the road, it was getting more densely populated with fishermen wetting their lines and nets. So JD got out of the car and subsequently landed the drone. 4K video edited with Pinnacle Studio 21. Music generated by Pinnacle SoundStage. A Yuneec Typhoon H hexacopter provided a bird's eye view of some birds (ducks, egrets, others) at City Park Lake in Baton Rouge. Had to hustle to get this flight up and down before a TFR (Temporary Flight Restriction) went into effect for the nearby Southern University football game against Arkansas Pine Bluff. 4K video edited with Pinnacle Studio 21, which also generated the sound track music. JD wasn't flying anything here. 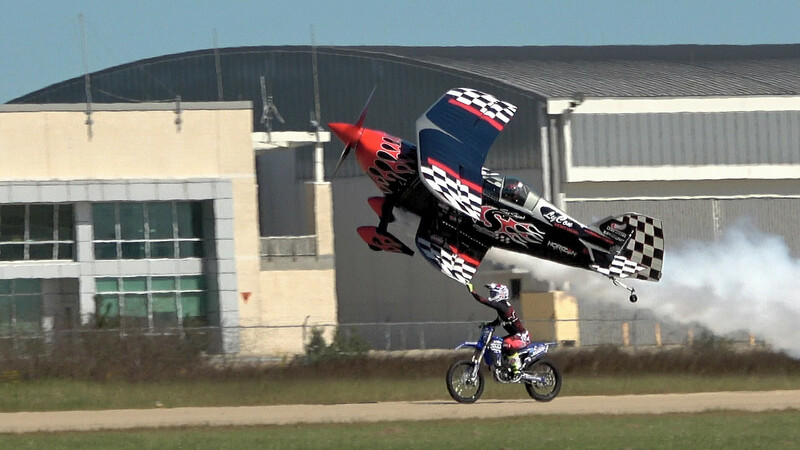 He was just watching the 2018 Hammond Air Show at the Hammond Northshore Regional Airport in Hammond, LA on October 21, 2018. He had his 4K camcorder handy, and ended up with this video, edited down to just over an hour. 4K video of a river levee run of a Yuneec Typhoon H along the Mississippi River a mile or two downriver from the L'Auberge Casino near Baton Rouge, LA. August 30, 2018. JD flies his original Typhoon H #1 out to pasture. But he flies it back, too. 4K video straight from the camera with a touch of music and some titles. Edited with Pinnacle Studio 21.5 and its royalty-free Soundstage music. Just a fun flight to get a battery down to storage voltage (they like being half full for long term storage). The pasture is about half a mile away. Note to Microsoft Edge browser users: If you want to watch in 2K (1440p) or 4K (2160p) and are not offered the option to do so, it may help to type about:flags in the address bar and find the drop-down for "Enable VP9 video format" under "Standards Preview" and set it to Always on. Restart browser.